Tailored to provide superior RAM and PCIe compatibility, the NH-D15S is an asymmetrical single fan version of Noctua’s award-winning flagship model, the NH-D15. Thanks to its asymmetrical design, the NH-D15S clears the top PCIe slot on most µATX and ATX motherboards. At the same time, the single fan setup and recessed lower fins guarantee 100% RAM compatibility with memory modules of up to 65mm height. Users who have sufficient room can also upgrade the cooler with either a 120mm or round 140mm fan on the front fin stack for further improved performance in dual fan mode. Topped off with the trusted, pro-grade SecuFirm2™ multi-socket mounting system, Noctua’s proven NT-H1 thermal compound and full 6 years manufacturer’s warranty, the NH-D15S forms a complete premium quality solution that combines dual tower efficiency with excellent compatibility and flexible upgrade options. Compared to the award-winning NH-D15, the S-version uses an off-set, asymmetrical layout and a single instead of dual NF-A15 fans. This allows the NH-D15S to provide state-of-the-art heatsink performance while maintaining superior RAM and PCIe compatibility. Thanks to its recessed lower fins, the NH-D15S provides 65mm clearance for tall memory heatsinks, making it compatible with most high end modules on the market. As the lower fins are recessed on both sides of the heatsink, compatibility is excellent not only on LGA115x and AMD, but also on LGA2011 where there are RAM slots on both sides of the socket. Complying with Noctua's AAO standard and featuring sophisticated aerodynamic design measures such as Flow Acceleration Channels, the NF-A15 has quickly built up a reputation as one of the best 140mm fans on the market. Using the supplied extra fan clips, the NH-D15S can be upgraded with either a second round-frame 140mm fan with 120mm mounting holes (such as the NF-A15) for maximum performance or a common 120mm fan (such as the NF-F12) for improving performance while maintaining compatibility with RAM modules of up to 45mm height. 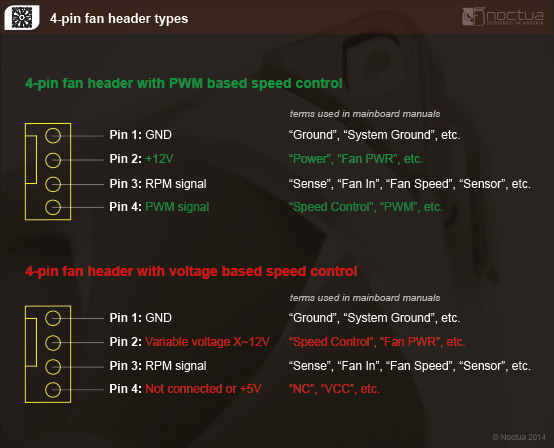 The NF-A15 premium fan supplied with the NH-D15S supports PWM for convenient automatic speed control through the motherboard. In addition, the maximum fan speed can be reduced from 1500 to 1200rpm using the supplied Low-Noise Adaptor for even quieter operation. Extending below the fin-stacks, the large NF-A15 fan not only contributes to the superb CPU cooling capabilities of the NH-D15S but also provides massive airflow over surrounding motherboard components and heatsinks, thus ensuring excellent component cooling performance. Noctua's SecuFirm2™ mounting systems have become synonymous with quality, safety and ease of use. Supporting Intel LGA115x (LGA1150, LGA1151, LGA1155, LGA1156), LGA2011 (LGA2011-0 & LGA2011-3), LGA2066 and AMD (AM4 (since 2019), AM3(+), AM2(+), FM1, FM2(+)), the SecuFirm2™ mounting included with the NH-D15S guarantees perfect contact pressure and maximum convenience on all current sockets. Complying with the open SecuFirm™ standard, the NH-D15S can be made compatible with the older LGA1366 and LGA775 sockets using the optional NM-I3 mounting kit, which is provided by Noctua free of charge. If technically possible, Noctua will also provide upgrade kits for future sockets. Having received more than 100 awards and recommendations from hardware journalists around the world, Noctua's NT-H1 is a proven professional grade TIM solution that provides minimum thermal resistance, excellent ease of use and outstanding reliability. Noctua products are renowned for their impeccable quality and outstanding longevity. Like all Noctua fans, the supplied NF-A15 features an MTTF rating of more than 150.000 hours and the entire NH-D15S package comes with a full 6-year manufacturer’s warranty. *Please refer to our motherboard compatibility list for detailed information. Max. acoustical noise with L.N.A. There isn’t a whole lot new or special about Noctua’s NH-D15S CPU cooler, however it still performed very well and darn near identical to the NH-D15 – as it should. The Noctua NH-D15S is a fantastic CPU cooler that improves on the already outstanding NH-D15. Overall, it usually stays within 1-2 °C of its sibling. With such fantastic performance on mainstream processors, the loss of a second fan does little to dampen its performance. It also doesn't hurt that noise levels are just as expected in that it's nearly silent. At 64 mm under the fins, memory clearance is good, and with the new asymmetrical design, expansion-slot clearance is greatly improved as well. Much like all Noctua coolers, the NH-D15S is easy to install thanks to the SecuFirm 2 mounting hardware, and let's face it, that paired with its exceptional build quality make this cooler a bit of a treat to work with. The fact that it's well packaged and has a nice accessories bundle is just icing on the cake. Oh and who can say no to an industry leading no fuss six year warranty? What is there really left to say? Noctua took what was already an award winning and well liked flagship cooler, and made it that much more user friendly. Of course, not everyone will appreciate this sort of cooler, but as an Intel X99 user, trying to populate the first slot with the GPU, it takes something offset like this product to work well in that instance. Most other offerings either are much smaller and not as efficient, or they just don't care and they go ahead and block things off. Macht man sich daran die Kühlleistung dieses Blocks zu untersuchen, dann kann man sich definitiv nicht beklagen, sprich mit den NH-D15S erhält man einen äusserst leistungsstarken Luftkühler, der aber auch alles andere als klein ausgefallen ist. Dementsprechend ist eine mehr als nur solide Performance Pflicht. Diese erhält man dann auch, wobei aber nicht nur tiefe Temperaturen das Resultat sind, sondern auch eine geringe Geräuschkulisse.Hinsichtlich Geräuschpegel kann man sich beim NH-D15S von Noctua nicht beschweren. Bei 7 Volt betrieben, ist der Lüfter unhörbar und selbst bei 12 Volt kann man den Kühler noch als leise bezeichnen. Once again, Noctua has absolutely blown us away with their latest cooler. Delivering class-leading performance, this cooler ticks all the right boxes for anyone building a system. Not only is it one of the quietest coolers we’ve ever tested, it managed to stay quiet even when we dialed in some hefty overclocks, meaning your gaming system or workstation should stay whisper quiet, even when you’re putting the heat on your CPU. Cooling performance is amazing in all our testing, and while it does run a little warmer than the Noctua NH-D15, that was to be expected given the switch from two fans to one fan, which is a move to increase compatibility more than anything. However, despite the halved number of fans, the performance is still extremely competitive and that just shows how much of the performance comes from the build quality and cooling tower design of this unit, not just the fans. The D15 model is superior and we highly recommend that if you want a Noctua cooler, that’s the one you invest in, but there’s a clear market for the D15S that we appreciate Noctua providing a product for. If you’re running an X99 system, with large ram modules on both sides of the CPU socket, the added cutaways of this model will allow you to maximize compatibility with your hardware. This does come at the cost of losing the first PCI slot, at least on most motherboards, but turn the cooler 90 degrees and you gain that slot back, albeit at the cost of having to use standard profile RAM; at least you have that option. Mit dem NH-D15S bietet Noctua keinen wirklich neuen Kühler an. Stattdessen ist er praktisch eine Variante des erfolgreichen NH-D15 mit verbesserter PCIe- und Speicher-Kompatibilität. Die asymmetrische Gestaltung und der Wegfall des Zweitlüfters ebnen dafür den Weg. Dabei zeigen unsere Messungen, dass der Unterschied zwischen Single- und Dual-Fan-Betrieb im Normalbetrieb minimal ist. Für viele Nutzer dürfte der NH-D15S deshalb tatsächlich auch die bessere Wahl sein: Sie müssen weniger Kompatibilitätsprobleme fürchten, dafür aber kaum Abstriche bei der Kühlleistung machen. Und für den Fall der Fälle liegen auch dem NH-D15S ein zweites Paar Lüfterklammern bei. Dabei büßt die Hochkompatibilitäts-Variante des NH-D15 nichts vom Premiumanspruch des Originals ein. Von der aufwendig gestalteten Verpackung über den perfekt verarbeiteten Kühler und den immer kultiviert arbeitenden Lüfter bis hin zum umfangreichen Zubehör zeigt sich auch der NH-D15S ganz als Premiumprodukt. Nicht vergessen werden sollte auch die ungewöhnlich lange Garantiedauer von sechs Jahren. Klammert man den semi-passiven Betrieb aus, ist der Noctua-Kühler zudem ausgesprochen leistungsstark. Letztlich bietet Noctua mit dem NH-D15S so ein rundum stimmiges Paket für den anspruchsvollen Nutzer an. In terms of performance, the NH-D15 and NH-D15S are pretty much identical with the exception of having one fan. This is important because in most scenarios, the single middle fan can handle most of the work and even when pushed to higher OC where all other heatsinks throttle, the single fan NH-D15 was very close. Most would think that to get more always means adding things but Noctua stepped back and evaluated that the value to the consumer is much greater if the second NF-A15 fan was removed. Aside from being known for their quality and silent coolers, Noctua is also known for very high priced products and thus is out of reach for many consumers. Since each of these Noctua NF-A15 fans cost $25-30 when purchased in retail, removing one from the NH-D15 bundle lowers the price to a much more affordable $74.90 (MSRP) which makes the NH-D15S very competitive against many other high-end coolers value-wise. The shift of the heatpipe balance also fixed the single nagging clearance issue that the original NH-D15 had and that is mini-ITX and micro-ATX compatibility. With the PCI-E x16 slot sitting close to the CPU socket keep-out zone, the large NH-D15 prevented graphics card installation on many motherboards but the NH-D15 has no such problem (unless the user is an idiot and did not read the manual, resulting in an opposite installation). The NH-D14 was the King of the Hill for several years - it was the standard that other coolers were judged against. In logical progression comes the D15 and with all the improvements, it assumed the title from the D14 as the new King of the Hill. Well, now it must share the throne with the equally potent D15S. At first glance, the D15S looks almost identical to the D15, and for the most part it is. But it has a few tricks up its sleeve that provide RAM and PCIe compatibility that the standard D15 does not have. The offset, asymmetrical base allows the D15S to clear the top PCIe slot on most µATX and ATX motherboards. And since the D15S has only one fan, you have some additional RAM space. You may not think this is a big deal until you have clearance issues. Not with the D15S. Memory modules up to 65mm tall are no problem and your first PCIe slot is open for business. The performance is on par with the D15, which is really no surprise. The D15S is clearly built to keep the heat of overclocking under control with its massive dual towers and capable (and quiet) NF-A15 fan. Noctua's well-known SecuFirm2™ multi-socket mounting system makes the installation a breeze. If you have ever installed a Noctua cooler with the SecuFirm2™, you know what I mean. There are two key factors that determine the success of a cooler. One is a properly designed heat sink that can effectively transfer the heat away from your CPU and into the fin stack, and the other is a fan that can efficiently move air through the fin stack. The NF-AF15 140mm fan effortlessly handles this task. Well, what can we say, in terms of traditional tower coolers, the high clearance, increased compatibility version of the mighty D15, with its off-set fin stack to improve GPU compatibility, 65mm of clearance underneath to decrease issues with high heat sink RAM, and only a single fan to further lessen RAM issues has totally wiped the floor with all but its bigger brother. We were expecting it to do well, but we really weren't expecting the results we got. Go back and have a look at the charts and you'll see that this cooler is only half a degree off the pace of the D15 at 4.4GHz and beasting a good few of the AIOs on the market. The NM-I3 SecuFirm2™ Mounting-Kit makes Noctua CPU coolers compatible with Intel's LGA775 & LGA1366 sockets. The NM-AM4 SecuFirm2™ mounting-kit makes Noctua CPU coolers compatible with AMD's AM4 socket. How big is the NH-D15S and how much clearance does it provide for RAM and mainboard heatsinks? Which sockets are supported or can be supported using upgrade kits? Can I upgrade my existing Noctua cooler to socket TR4 or SP3? I’ve used all the NT-H1 thermal compound that came with the cooler, can you send me more? What’s the difference between NH-D15 and NH-D15S? My Intel CPU is running too hot although my heatsink supports the specified TDP, what's the problem? How much torque should be applied when tightening the screws of a Noctua CPU cooler? How can I check whether my case is wide/high enough for the cooler? How to remove the base protection cover? Does the package include a backplate for AMD AM2(+)/AM3(+)/FM1/FM2(+)? Can the cooler be installed turned by 90° on AMD sockets? I can't open the socket due to the mounting bars! Why doesn't the supplied backplate fit my LGA2066 / LGA2011 motherboard? Should I take the cooler off before transporting my system? Why doesn't the base of Noctua coolers have a polished, mirror like finish? 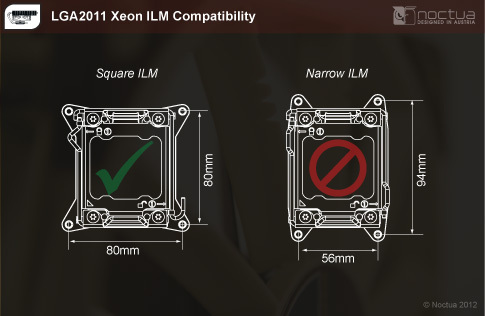 Does the mounting-system support LGA2011 based Xeon CPUs? Why is the cooler’s contact surface slightly convex? Which Noctua CPU coolers are compatible with Intel LGA2066? Can I keep using the backplate / mounting system of my previous Noctua cooler for my new one? My unlocked Intel CPU is running too hot although my heatsink supports the specified TDP, what's the problem? 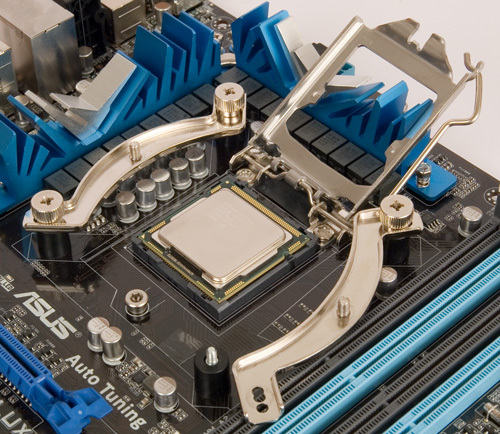 Is it a problem that the CPU heatspreader is not covered completely by the heatsinkbase on LGA2011-3? 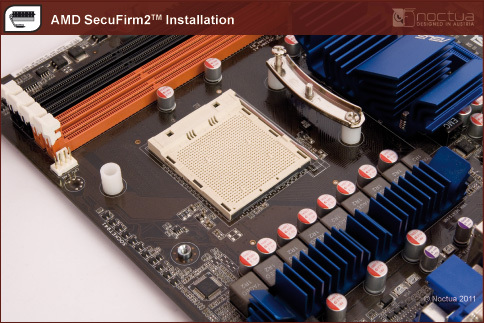 How can I check whether my AMD mainboard has a standard AMD backplate that’s compatible with the SecuFirm2™ mounting system and how should I proceed with the installation? Is the cooler compatible with the LGA1151 socket? Is the cooler compatible with the LGA2011-3 socket? Is the cooler compatible with LGA775 and LGA1366? How can I check if my Noctua CPU cooler already includes AM4 mounting parts? Please refer to our socket compatibility chart. Unfortunately, it is not possible to upgrade existing Noctua heatsinks to support the AMD TR4 and SP3 sockets for Ryzen Threadripper (X399) and Epyc CPUs. TR4/SP3 CPUs have much bigger heatspreaders (as compared to e.g. 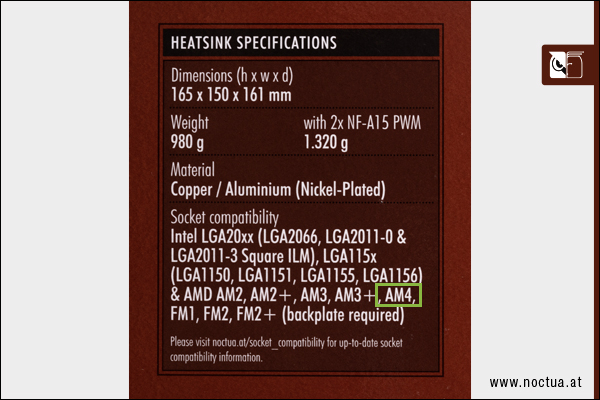 LGA2066 or AM4 processors) and the contact surfaces of standard Noctua heatsinks would cover only about half of these heatspreaders, which would result in insufficient cooling performance. On top of that, the heatpipes of bigger cooler models like the NH-D15 or NH-D15S would completely block the RAM slots on many TR4/SP3 motherboards. For this reason, Noctua has introduced the new NH-U14S TR4-SP3, NH-U12S TR4-SP3 and NH-U9 TR4-SP3 cooler models that feature bigger contact surfaces and have been tailored to fit TR4 and SP3 systems. Please choose these models for AMD Ryzen Threadripper and Epyc systems. Please kindly note that the NT-H1 thermal compound supplied with our coolers is a consumable item so our manufacturer’s warranty does not include providing additional thermal compound. You can purchase NT-H1 from our resellers. Asymmetrical design: While both coolers are 150mm wide, the NH-D15S is off-set towards the top edge of the motherboard and thus provides more clearance towards the PCIe slot. RAM clearance: While the front fan of the NH-D15 overhangs the RAM slots on many motherboards, the single fan NH-D15S provides 65mm clearance for tall RAM modules on all compatible sockets. 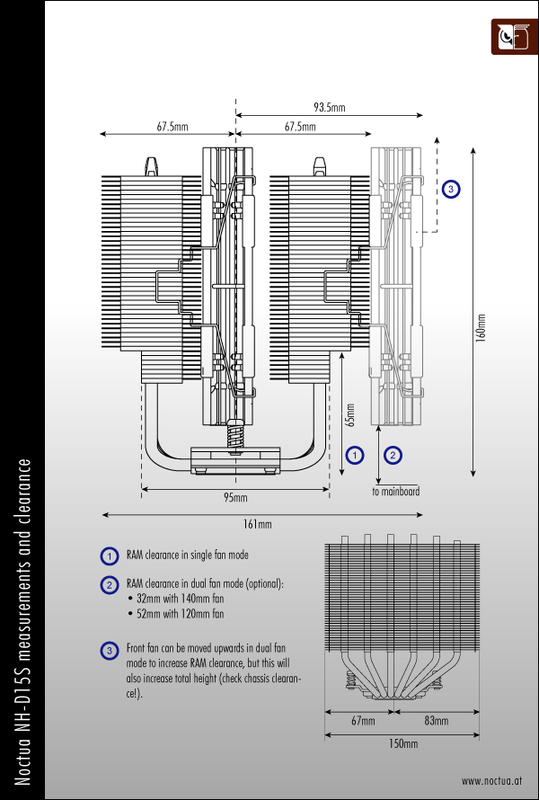 Total height: While the front fan of the NH-D15 must be installed slightly higher in order to provide sufficient clearance for standard height (32mm) RAM modules, the single center fan of the NH-D15S can be installed lower on the fin stack. As a result, the total height of the NH-D15 including fans is 165mm whereas the total height of the NH-D15 including its single center fan is only 160mm. Performance: While the base performance of the NH-D15 and NH-D15S heatsinks is identical, the dual fan configuration of the NH-D15 can provide 1-3°C better performance. Users who have sufficient room can also upgrade the NH-D15S with either a 120mm (e.g. NF-A12x25 PWM) or round 140mm (e.g. NF-A15 PWM) fan on the front fin stack in order to achieve the same performance levels as the NH-D15. The fan clips for installing a second fan are included with the NH-D15S. Current processors from Intel, especially the unlocked models with the suffixes C, K, X or XE (e.g. Core i7-8700K, Core i9-7900X oder Core i9-9900K) can dissipate noticeably more heat than indicated by the TDP specification. the TDP limits are extended or disabled. the motherboard applies automatic overclocking by default, e.g. by raising the supply voltage of the CPU and using higher Turbo-Mode multipliers. Depending on the load scenario and CPU configuration settings, the actual power draw can be 1.5-3 times as high the stated TDP value. This can lead to temperature issues, especially when using smaller coolers, compact cases or cases with poor airflow, when some applications create very high loads, e.g. Prime95 with AVX2 support, 3D-rendering or simulation software. The actual power draw of the processor can be monitored with software provided by the motherboard vendor or with 3rd party tools like HWInfo or HWMonitor. If you encounter temperature issues (>90°C) and notice a higher than specified power draw, please ensure that no automatic overclocking is applied. You might also want to limit the TDP to either the specified value by Intel or a value that is 5-10W below the value previously read out from the CPU. This can be done in BIOS by setting the “Long Term Duration Power” manually instead of “Auto”. Furthermore, it may also help to lower the CPU clock speed for applications that heavily use the AVX instruction set, which can lead to higher loads and power draw. This option is usually referred to as “AVX offset” and makes it possible to lower the multiplier specifically for AVX based applications without reducing performance when using other instruction sets. Depending on the quality of the CPU and the programs being used, a reduction of 2-3 steps usually gives very good results. Please contact your motherboard vendor for details if you have trouble finding the appropriate settings in the BIOS. All our TDP recommendations are based on thorough testing with the default values specified by Intel using popular applications such as Asus Realbench and prime95. Please note, however, that prime95 creates a particularly high load that goes beyond most typical application scenarios and this leads to elevated temperatures. We thus recommend using other programs such as Realbench for checking the stability and temperatures of the CPU in realistic scenarios. Please also note that CPUs that use thermal paste instead of soldering between the DIE and the heatspreader generally run hotter. Due to the thermal bottleneck created by the thermal paste, temperatures can be high even at the specified TDP. 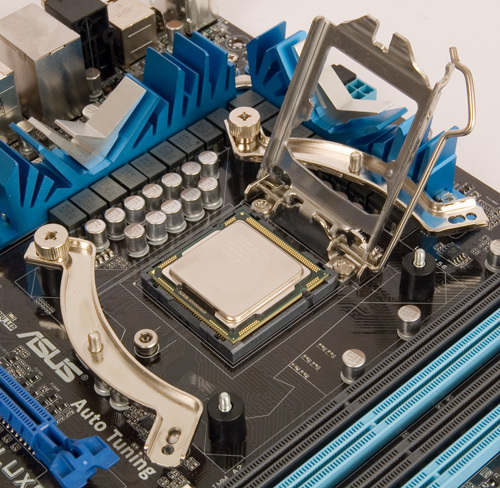 Most case manufacturers provide specifications for maximum CPU cooler height/clearance. Please refer to these specifications in order to verify that the cooler will fit the case. If no specifications are available, please contact the case manufactuer or measure the distance from the motherboard tray to the side panel (tower cases) or top panel (desktop cases). If this distance is bigger than the height of the cooler + 15mm (mainboard spacers + mainboard + CPU), the height/width of your case should be sufficient. Noctua CPU coolers are shipped with a plastic protection cover at the bottom side of the cooler, which protects the contact surface against scratches and other damage. The base of Noctua CPU coolers is made from hard-wearing nickel plated copper, so there's nothing to worry about if you buy a Noctua cooler from second hand or if your cooler didn't come with a protection cover. Please proceed with the installation as explained in the manual. No. As most AMD mainboards come with a stock backplate preinstalled, the cooler doesn’t include an AMD backplate. If your mainboard doesn’t have a backplate, please contact our support team at support@noctua.at. No. The new SecuFirm2™ mounting system for AM2, AM2+ and AM3 uses the same standardised hole spacing as the Intel system and thus allows for a much easier installation, but the cooler cannot be installed turned by 90°. Please first loosen one of the two thumbscrews that hold the mounting bars in place. Then untighten the second screw so that you can swivel the mounting bar and open the socket. Depending on the position of the mounting bars, you may need to swivel both. 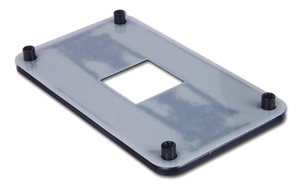 The supplied backplate is for LGA115x only and there is no backplate required for installation on LGA20xx (LGA2066, LGA2011-3, LGA2011-0). Please refer to the installation manual or our installation video for how to install the heatsink on LGA20xx. As it is not possible to reliably calculate or control the forces that act upon a system during transport (e.g. in shipping), we generally recommend, for safety reasons, taking the cooler off. Noctua cannot be held responsible for any damage that may arise due to excessive stress during transport if you keep the heatsink installed. As most of today's PC enthusiasts use high-viscosity thermal compounds, the contact surface of Noctua coolers is optimised for use with this type of pastes. The micro-grooves at the contact surface ensure that high-viscosity thermal compounds are dispersed to a uniform thin layer across the whole contact area and that no air pockets remain between the cooler and the CPU. With a polished, mirror like surface, the risk of uneven dispersion is much higher. As too thick layers of thermal paste and air pockets drastically deteriorate heat transmission, the micro-grooves are is of vital importance to the overall cooling performance of Noctua coolers when used with today's high-viscosity thermal pastes. As the Integrated Heat Spreaders (IHS) of today’s CPUs are slightly concave, the cooler’s contact surface has been deliberately designed to be slightly convex in order to ensure optimal contact. This way, more contact pressure will be applied at the centre of the IHS directly above the DIE, which results in better heat transfer and improved overall performance. Due to the heatsink mounting mechanism being identical on LGA2011 and LGA2066, Noctua’s SecuFirm2™ mounting systems for LGA2011 also support Intel’s upcoming ‘Basin Falls’ X299 HEDT (High End Desktop) platform for ‘Skylake-X’ and ‘Kaby Lake-X’ processors. Most current Noctua coolers already include SecuFirm2™ mounting systems for LGA2011 and can thus be used on LGA2066 motherboards without any upgrades or modifications. Most Noctua SecuFirm™ mounting parts are cross-compatible, so if you’re replacing one Noctua cooler with another, it is usually possible to keep the original backplate and/or mounting system in place in order to re-use it for the new cooler. If you had your previous Noctua cooler installed on an Intel LGA115x (LGA1156, LGA1155, LGA1151, LGA1150), LGA2011 (LGA2011-0, LGA2011-3) or LGA1366 system and replace it with an NH-U14S, NH-U12S or NH-U9S, you only need to replace the original mounting bars with the NM-IMB3 ones supplied with the new cooler. For all other models, you can keep the entire mounting system in place on the aforementioned Intel sockets. On AMD AM2, AM2+, AM3, AM3+, FM1, FM2, FM2+, you only need to replace the original mounting bars with the ones supplied with the new cooler. the TDP limits are extended or disabled in the motherboards' BIOS. some software creates untypical loads, e.g. Prime95 with AVX2 support and a) and/or b) apply. This can lead to temperature issues, especially when using smaller coolers or compact cases. If you encounter temperature issues (>90°C) and notice a higher than specified power draw, please ensure that no automatic overclocking is applied and limit the TDP to the specified value by choosing appropriate BIOS settings. For Kaby Lake CPUs, it may also help to lower the CPU clock speed for applications that heavily use the AVX instruction set, which can lead to higher loads and power draw. This option is usually referred to as “AVX offset” and makes it possible to lower the multiplier specifically for AVX based applications without reducing performance when using other instruction sets. Depending on the quality of the CPU and the programs being used, a reduction of 2-3 steps usually gives very good results. All our TDP recommendations are based on thorough testing with the default values specified by Intel using popular applications such as Asus Realbench and prime95. Please note, however, that prime95 creates a particularly high load that goes beyond typical application scenarios and this leads to elevated temperatures. We thus recommend using other programs such as Realbench for checking the stability and temperatures of the CPU in realistic scenarios. No. Depending on the orientation of the cooler, 1-2mm at the outer edge of the heatspreader may not be covered by the heatsink base. As the heat is concentrated at the center of the CPU and the outermost parts are irrelevant for heat-transfer, this is no problem at all. 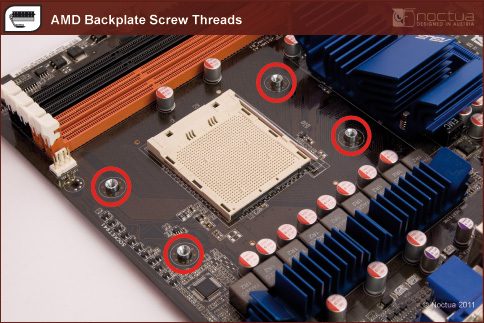 The SecuFirm2™ mounting system requires a standard AMD backplate (either plastic or metal) with screw threads as shown on the pictures below. 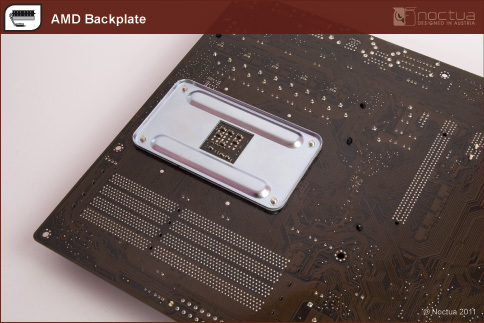 These backplates are pre-installed on the rear side of most AMD mainboards (see first picture below) and fixed to the retention module with four screws (see second picture below). 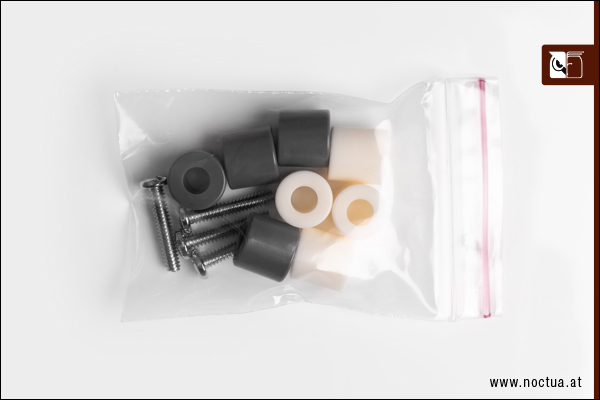 If your retention module is fixed with plastic bolts instead of metal screws, please contact support@noctua.at in order to obtain an appropriate backplate. 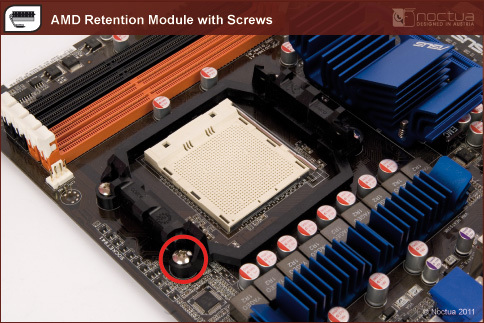 In order to proceed with the installation of your Noctua cooler, please remove the four screws and the retention module but keep the backplate in place so that you can see the screw threads from the top side of the motherboard (see third picture below). You can then proceed with the installation of the SecuFirm2™ mounting kit as described in the manual (see fourth picture below). Yes. Due to the heatsink mounting mechanism being identical on LGA1150, LGA1151, LGA1155 and LGA1156, the cooler also supports LGA1151. Yes. 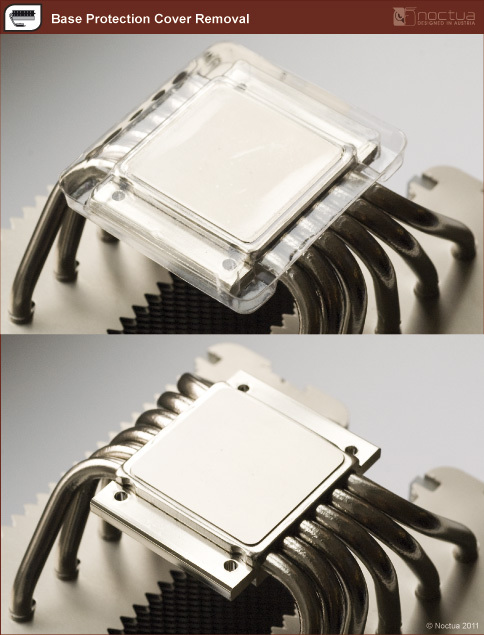 Due to the heatsink mounting mechanism being identical on LGA2011-0 and 2011-3, the cooler supports both types of LGA2011-3. The cooler does not support LGA775 and LGA1366 out of the box, but can be made compatible using the NM-I3 mounting kit. Noctua provides the NM-I3 kit free of charge if a proof of purchase (scan, photo or electronic copy of the invoice) of the cooler and an LGA775 or LGA1366 motherboard or CPU are presented. In order to install the cooler using the NM-I3 kit, please first unscrew the center screw of the original one-piece fastening bracket (you can reach through the fin stack using the long screw driver supplied with the cooler) and remove it. 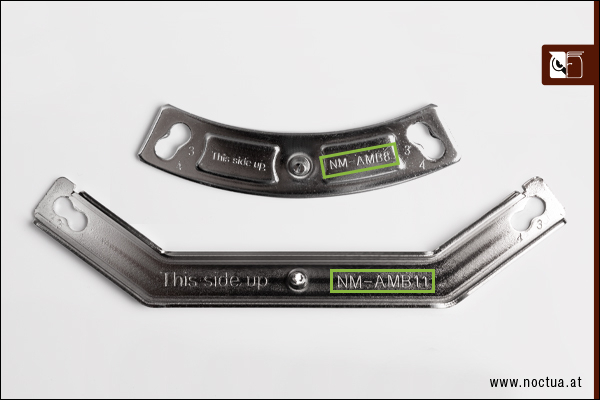 Then install the two fastening brackets of the NM-I3 kit as described in the NM-I3 installation manual. Check the socket compatibility specifications on the packaging. If they include AM4, AM4 parts are included. Opening the packaging, check the printing on the accessories box. If the AMD parts pictured on the box include both a white and a grey spacer, the cooler supports AM4. Opening the accessories box, check the AMD bag. If it includes both white and grey spacers, the cooler supports AM4. 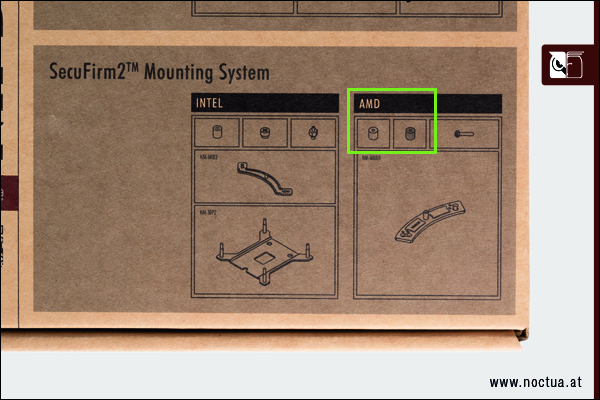 Check if the AMD bag contains either NM-AMB8 or NM-AMB11 mounting bars.